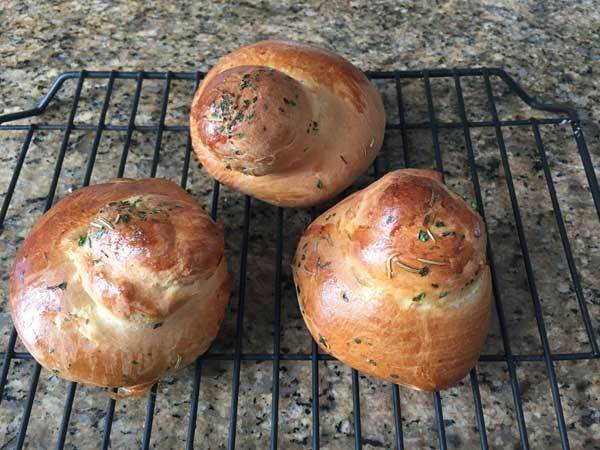 This herbed brioche is savory and a little lighter than other versions. It's based on the Italian version of brioche, Brioche Col Tuppo. Combine the flour, instant yeast, sugar, and salt in a stand mixer bowl. Add the softened butter and mix it around so that it coats the flour. Pour the warm milk into the flour mixture and stir until blended, then add egg and stir to make a soft dough. Attach the dough hook to the mixer and let the mixer knead the dough until it is smooth and elastic. (Note: This is the point where you add the herbs, if using). Transfer the dough to a greased bowl, then cover and let it rise until doubled in bulk (about 60 minutes). Punch down the dough and divide into 6 equal portions of about 75 grams each. Pinch off a small piece (about 10 to 12 grams) "the tuppo" (the little top part). Form each of the large portions into a ball and make a little hole in it. Shape the little "tuppo" section you snipped off into another little ball and press it onto the top. Arrange the rolls evenly on the baking sheet and let rise for another 45 minutes or so. Brush the brioche rolls with some egg and water and put them in the 400 degree oven. Immediately reduce heat to 375. Bake for 18-20 minutes until golden brown. Keep an eye on them because they start browning pretty quickly. If they are brown after 15 minutes, lay a sheet of foil loosely over the rolls.